When Click Box sent us a demo we directly had him on the radar. Click Box has released half a dozen eps on m_nus and Item & Things in recent years. As many of you might remember "Fun K Mouth" or "Sugar Pain" were huge in the techno scene in 2008 and kicked of Click Boxs career. The unique analogue sound is still exceptional for the Brazil techno scene up to now. Click Box was influenced by people such as Troy Pierce, Depeche Mode, Joy Division, New Order, Daniel Bell, Cabaret Voltaire, The Cure alongside others and so shares the love to some of our favorites with us. His EP opens up with "Things". A rough and repetitive track that is sucked deeper and deeper in to the vortex of a looped sound. It shows a connection to Detroit /Chicago minimal music and producers such as Daniel Bell, Robert Hood and Terrence Dixon at they're early stages. So expect no stunts but warped sounds here. "The System 2 Point 2" is more techno sounding with pounding drums and discoish lush, small, flirting sounds. The track pretty much adds sounds in the course of the track and so builds up a tension. "Rump" connects to "Things" with more ghostly sounds involved and a Brazilian flavor to the beat programming, which could be used to mix into another track to make a transition. "Like You" is a rhythmic trax with fine tunings and micro variations. Variation also comes from the percussive side. 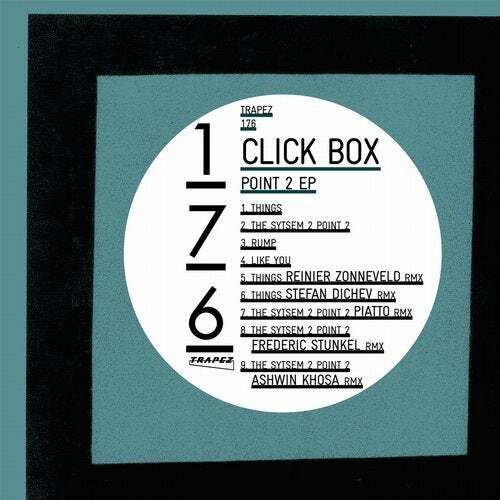 We asked Reinier Zonneveld from Trapez to remix "Things" and it seems that it was a spiritual experience for him since he has picked up the retentive side of Click Box very well, adding some cool twists to the original which makes it a nice hypnotic remix. Stefan Dichevs remix of "Things" emphasizes the Chicago approach of the original and ads a nice old school traxx flavor. Piatto calls his remix of "The System 2 Point 2" the 6 am remix which makes sense when you listen to the detroitish vibe in the break down. Frederic Stunkel also remixed "The System 2 Point 2" but the outcome is totally different, moving the track into a mean and dark rocking area using fresh new school influences combining it with some traxx like percussion. Last but not least Ashwin Khosa has remixed "The System 2 Point 2" into a heavy but deep + funky groover, adding a bit more of a funky vibe to it and incorporating a nice break down here.